IPLab images The images are collected in a compressed tar file (10 MB compressed, 18 MB uncompressed!). They are in IPLab format, which can be read using a simple Matlab function iplab_read. TIFF images The images are available in TIFF files, with 16 bits per pixel. This format can be read by a number of applications, including Photoshop. There is a choice of either a compressed tar archive (about 10MB compressed, 18MB uncompressed) or a ZIP archive (about 10MB). OpenEXR images The images are also available in the OpenEXR high-dynamic-range image format. Each pixel is represented as a 15-bit floating-point number with a 10-bit mantissa and 5-bit exponent. There is a choice of either an uncompressed tar archive (about 8MB, gzip compression shrinks it by only 0.4%) or a ZIP archive (about 8MB). Transmission spectra of the 7 corresponding filters, the lens system, and the response spectrum of the camera are available from our page with measurement data. As an rgbe file. RGBE is a floating point image format for which the specifications and I/O functions are available. As an mdla file. MDLA is a format defined at Cornell for scene descriptions, with specifications that are easily extendible. As an Inventor file. The RGB reflectance values in this file are for previewing purposes only; they do not correspond to the real spectral data. Surfaces are assumed to be Lambertian. The reflectance spectra have been measured at discrete wavelengths (in nm). 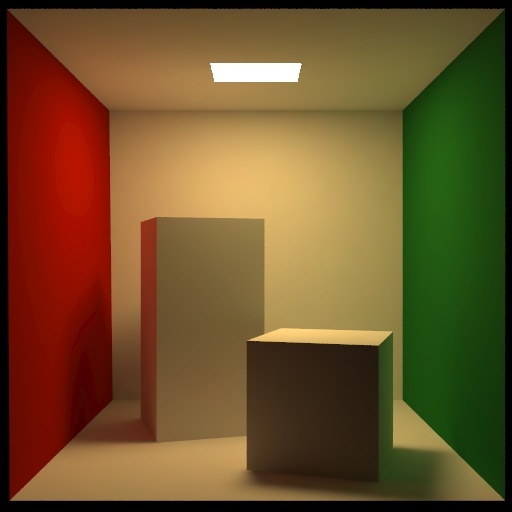 The geometry has been measured from the physical Cornell Box. The surfaces are therefore not perfectly perpendicular. All surfaces are quadrilaterals. They are specified below by their vertices.